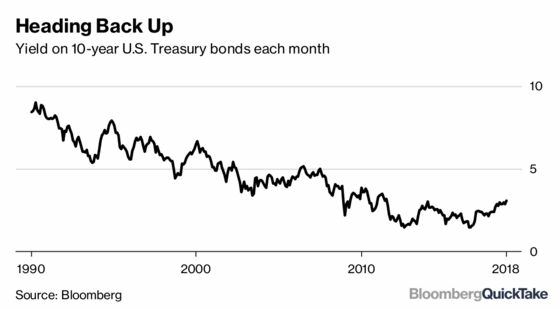 (Bloomberg) -- When central banks started cutting interest rates to near zero after the 2008 stock market crash, they saw it as an emergency measure and thought things would gradually get back to normal. Ten years later, they’re wondering what normal means. For the past decade, rates have been super-low, and many economists came to believe they’d stay that way. They argued that the so-called normal or neutral rate of interest — which neither stimulates the economy nor cools it down — had fallen, perhaps permanently. But now the debate is shifting again. Central banks are moving to tighten policy by raising interest rates, while steady growth and fresh economic stimulus from tax cuts and public spending are leading some to believe that the neutral rate is creeping back up. The implications for savers, investors and economic-policy makers will be far-reaching. The possibility that the neutral rate is rising is influencing the Fed’s current thinking on monetary policy. The Fed’s long-term projection of its policy rate is inching higher. It was 2.8 percent at the end of 2017; it now stands at 3 percent. As the policy rate rises, Fed officials are emphasizing that estimates of the neutral rate — where rates might end up — are inherently uncertain. Until recently, interest rates had been heading lower for years. Average interest rates in 20 developed nations dropped from about 5 percent in 1990 to near zero in 2015, a Bank of England study found. Such low rates left central banks little or no room to cut again if more stimulus was required. The U.S., Europe and Japan used new tools to stimulate economic growth, from quantitative easing (buying government bonds in exchange for new money) to negative rates (pushing interest rates below zero). The policies weren’t as effective as central banks hoped, and fears grew that this wasn’t just a temporary problem. Since well before the crash, the world had settled into a pattern of investing less and saving more. The result was a global surplus of capital, and in turn a lower neutral rate of interest. While those long-term factors haven’t gone away, the view that the neutral rate is stuck is starting to shift. Nations’ neutral interest rates have historically tracked economic growth, which in turn is largely determined by productivity. In the U.S., the main index of productivity rose by almost 2 percent a year in the 50 years leading up to 1970; it’s grown by less than 1 percent a year since then. Many other countries have seen a similar slowdown. A narrowing gap between rich and poor countries (crimping opportunities for “catch-up” growth), smaller increases in the number of people getting a secondary education and fewer transformational inventions like air conditioning or computers add to the problem. Meanwhile, the increasing concentration of wealth within countries and the rising global ratio of workers to dependents (thanks to declining birth rates) pushed up savings. Rich people are big savers, and workers save more than dependents. At the same time, the falling price of machines and other capital goods kept spending on investment low. The surplus of savings acted to further lower interest rates. The neutral interest rate will rise if productivity growth recovers. That’s possible. Some economists, like Erik Brynjolfsson and Andrew McAfee, argue that the full benefits of technologies such as artificial intelligence haven’t yet appeared. Others, like Tyler Cowen, insist that persistently slow growth, also called secular stagnation, is the new normal. Whatever the underlying cause, the savings surplus complicated monetary policy after the crash by making low interest rates a less potent economic stimulus. Central banks had to find other ways of stimulating investment demand, such as quantitative easing (that central bank bond buying) and forward guidance (giving a clear direction to the markets, for instance by promising to keep interest rates low for longer than investors expected). More radical steps — such as so-called helicopter money and deeply negative interest rates — were talked about. But now that central banks are starting to remove monetary stimulus, those issues have been sidelined, at least for the moment. The new question is different: How far back up will interest rates need to go in order to get back to neutral? This Bank of England paper on falling global interest rates serves as an excellent guide to other sources. John Williams of the Federal Reserve bank of New York discussed monetary policy in the era of very low interest rates. An early advocate of weighing the neutral rate in policy decisions, more recently he’s cautioned against giving it too much attention. In his 2016 book, “The Curse of Cash,” Harvard University professor Kenneth S. Rogoff explains how abolishing paper money would make it possible to push interest rates as negative as necessary. Former U.S. Treasury Secretary Lawrence Summers and J. Bradford DeLong, professor at the University of California, Berkley, wrote on the role that fiscal policy ought to play. Robert J. Gordon, professor at Northwestern University, has written the book on the growth slowdown. Summers laid out the case for secular stagnation, and Ben Bernanke, the former U.S. Federal Reserve chairman, pushed back. A Bloomberg QuickTake on the subject.